Blizzard Survival - The Ultimate in Lightweight Thermal Protection: for Outdoor Safety, Survival and Casualty Care. It is not often that a survival product comes along and improves on existing technology so greatly that it allows professionals to change their approach to survival and casualty recovery - a product, which has improved on life saving technology for the military, outdoor enthusiasts, sports men and women or anyone involved in outdoor activities. Blizzard Survival use their own unique Reflexcell™ material in their products. Reflexcell™ took 15 years to develop and offers a lightweight wind and waterproof thermal solution to emergency survival shelters. Reflexcell™ offers a warmth to weight ratio that exceeds all other similar survival products currently on the market with a Tog rating of 8 Togs/KG which is similar to a 2 season sleeping bag. Reflexcell™ has a cellular construction to trap warm air. Elastic strips are built in between the layers, which help to draw the material to the body, reducing the amount of cold air and help prevent heat loss by convection. The material is silvered to help stop heat loss by radiation. Blizzard Survival products have proved so successful, that the RAF have changed their standard operating procedures for prevention and treatment of hypothermia and casualty evacuation. The Blizzard Survival Blankets and Blizzard Heat Blankets are being used very successfully for casualty evacuation in front line operational roles around the world, including Iraq and Afghanistan. The RAF has added Blizzard Survival Bags to the pilot’s survival kit in both the Apache Helicopter and Euro Fighter aircraft. These have replaced the heat sealed sleeping bags, saving on weight and bulk, whilst providing the pilots with lightweight weatherproof survival shelters. Blizzard Survival products were originally designed for hill walkers and climbers to help them survive emergencies on the hills. They are so popular that they have been adopted for use by anyone taking part in outdoor activities. The Blizzard Survival Bags have proven so efficient that they have replaced sleeping bags for many adventure racers, cavers and big wall climbers. I have been testing a Blizzard Survival Bag for well over a year now. It comes packaged in a nicely illustrated cardboard box that shouts quality. The bag is very tightly vacuum packed inside two heat shrunk clear plastic wrappers, which I believe are of the same Mil Spec plastic used by the military. Hardly affected by cold, they are easy to undo even in freezing temperatures. To open the Blizzard Survival Bag find the cut, marked with red ink, in each plastic wrapper and tear. This is still quite tough and might need the assistance of your teeth if you are hypothermic. If you do this carefully you are will be left with two bags, which can be used for collecting water or the like. The vacuum packed Blizzard Survival Bag measures approximately 23 x 11 x 4 cm and weighs approximately 380g. Inside the first wrapper, there are well laid out, clear and concise instructions. Once you have removed the Blizzard Survival Bag, open it out to its full size. The bag is constructed from a single sheet of Reflexcell™ material and has been formed into a tube using a double sided tape. There is a zip tie at the bottom of the bag and a plastic conduit with a pull cord at the top, which forms a hood, when drawn. Once the Blizzard Survival Bag is opened out, carefully stretch it out sideways and climb in. Then pull the material in a lengthways direction to help open the cells in the layers of material. Now adjust the bag around your head using the draw cord. Do not enclose your mouth or nose in the bag as this will trap the moisture of your breath inside. Some people have complained that Blizzard Survival Bags are noisy, but they are much less noisy than standard Mylar survival bags. This is partly due to the fact that the Blizzard Survival Bag holds its shape and supports itself to a degree. Once inside the bag you will be surprised how quickly you warm up. After a night’s sleep you will find only the minimum of condensation. It is important to wear clothing suitable for the weather conditions. However, although I found wearing too many clothes in the bag made me clammy, I have never woken up soaked in perspiration like I would have done in a traditional survival bag. Nor have I woken up in the night feeling cold, but I have only used the bag down to -8°C/17.6°F. The Blizzard Survival Bag is reusable, but does not pack down small. Blizzard Survival suggest sucking the air out of the cells in the bag with a Hoover to aid re-packing at home. A pouch to store the used bag is available from Blizzard Survival, who also offer a re-packing service. The Blizzard Survival Bag is an excellent bit of kit that anyone venturing into the great outdoors should carry, just in case! 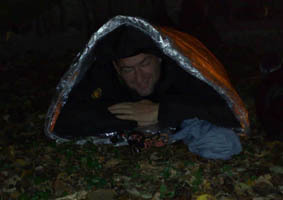 You will be carrying the peace of mind that you have a first rate survival shelter at your disposal. Add to this a Bothy bag, and you should be able to survive the worst Mother Nature can throw at you. If you have to deal with a casualty, you can cut off the zip tie and turn the bag into a blanket by carefully opening the seam, which is held together by double sided tape. Lift the casualty onto the blanket and re-seal the seam. Tuck the bottom of the bag under the casualty, or tie it off with some string for the best results. The Blizzard Survival Bag is small and convenient. You could keep a couple in your car as emergency sleeping bags, just in case you get stranded somewhere or caught out by snow. They are great as a lightweight solution for the authorities or aid agencies to issue at emergency shelters or during large scale evacuations. The Blizzard Survival Jacket is another great piece of kit using the Reflexcell™ material. It is constructed as a gilet, with a large extended hood and an elasticised hem. This is excellent to have in the bottom of your rucksack, if you get caught out and chilled. Slip it over your clothes, even if they are wet, and feel the effects of instant warmth and a boost to your morale. The jacket can be worn for added warmth in the Blizzard Survival Bag. Mountain Rescue issues the Blizzard Survival Jackets to chilled walkers and climbers, to allow them to walk out walking wounded. A couple of these jackets in your vehicle will give you instant warmth if you break down or find yourself stranded somewhere. The Jacket also comes in a long version called the Blizzard Survival Jacket Long. This being 1.8 meters long is enough to use as a makeshift sleeping bag. There is also the Blizzard Survival Jacket Military Spec. This jacket is shorter than the standard jacket. It comes with polythene sleeves, and the hood can be closed over the face by Velcro tabs. These features add to the weather protection of the jacket whilst increasing its thermal effectiveness. The Blizzard Survival Blanket is a large sheet of Reflexcell™ material and has a self adhesive strip to seal the blanket into a bag. This is ideal if your work with casualties. It allows you to lift the casualty onto the blanket, cover them and seal the blanket to get them out of the elements and trap their warmth. The self adhesive strip is resalable so you have access to the casualty to work on them and then reseal the blanket. The blanket also comes in the Blizzard Survival Blanket Small ideal for evacuating casualties by vehicle, for use with children or as a blanket in emergency shelters. The Blizzard Heat Blanket is the ultimate professional trauma response system for the prevention and treatment of hypothermia in casualties. The Heat Blanket is constructed of Reflexcell™ material in the form of a large blanket with draw cords top and bottom. The seam is sealed by Velcro down its full length, except for a small opening where the casualty’s face would be. Inside the blanket there are four removable chemical heat pads attached by Velcro, which self activate once exposed to the atmosphere. There are also two additional full length Velcro sealed seams down each side that give you access to the casualty. Elastic straps are used to pull the blanket into the casualty make the blanket more effective. After the casualty is placed in the blanket, it can be sealed, starting at the head by pulling the draw cord tight. Then the Velcro sides are joined, leaving an opening for the face. Finally the bottom draw is pulled tight and the elastic straps are fastened drawing all the lose material close to the casualty. The additional openings down each side of the Blizzard Heat Blanket allows full access to the casualty enabling you to work on or monitor them. Blizzard Survival make excellent products. I really believe that everyone who travels in or enjoys the outdoors should really carry at least a Blizzard Survival Bag in their kit as an aid to survival. I would suggest that you also carry a Blizzard Survival Jacket as these are great to help you keep moving whilst wet and cold giving you the advantage of not becoming a casualty to hypothermia.